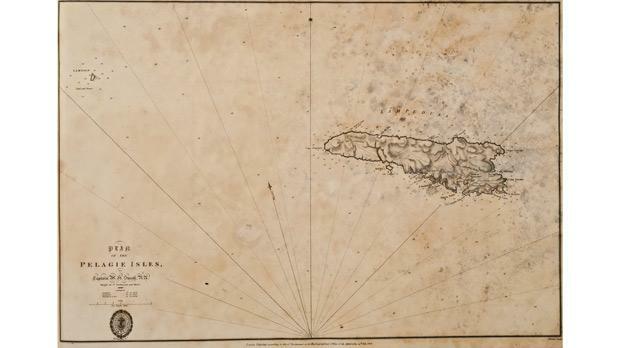 Engraved map of Lampedusa (above) and a chart of the island’s harbour (below), dated 1823, produced by Capt. William Henry Smyth of the Royal Navy. Malta and Lampedusa are geographically twin islands in the central Mediterranean, with Lampedusa being some 86 nautical miles to the south-west of Malta. Both islands have in recent days become witnesses to their waters becoming the graveyards of ‘the Middle Sea’. Only a few weeks ago, out of 250 asylum seekers who arrived from the African continent, the Maltese Armed Forces brought safely to land 143 immigrants, while another 56 were salvaged by the Italian Navy and taken to Lampedusa. Historically, the inter-relationship between the two islands goes back centuries. During the final phase of the Great Siege of Malta, the whole Catholic fleet left Syracuse on August 25, 1565, to come to the relief of the island from the Turkish invasion, but Don Garcia de Toledo, the doubting Viceroy of Sicily, willingly lost time at sea. Overtaken by a storm, he made a brief stop at Lampedusa, reaching Malta only on September 7, 1565. Throughout the next centuries, the fleet of the Order of St John roamed the Mediterranean, and the harbour of Lampedusa served as a shelter not only from bad weather but also from the Barbary corsairs and Ottoman vessels. During its caravans in the 18th century, especially when the Turkish navy was no longer a threat, the Order’s galleys could chart the coastal areas and islands of the Mediterranean. For 53 years, Antonio (or Antonino) Borg served as a pilot on the Order’s vessels. In 1738, he was appointed a pilot of one of the galleys of the Order, and chief pilot in 1733. He had a sound education in languages, arithmetic and navigation, besides being a researcher on Church and Maltese history. This notwithstanding his name was never mentioned by any Maltese writer until his biography appeared in the Malta Map Society newsletter in September 2011. Only two Italian cartographers had consulted his magnum opus at the British Library, while the Stylianous, authors of the cartography of Cyprus, included his chart but mistakenly gave him an Italian nationality. Borg charted just over 350 maps during his term of office. They were bound in four volumes, the first one being dedicated to Grand Master Manuel Pinto de Fonseca (1741-1773), while the other three volumes were dedicated to Grand Master Emanuele de Rohan (1775-1797). When the Knights of St John were thrown out of Malta by the French in 1798, those four volumes escaped the rapacity of the conquerors and they re­mained extant at the Naval Arsenal. On February 23, 1843, they were presented to the British Library by Captain Francis Beaufort, R.N., who must have realised their immense value. One of the volumes dedicated to De Rohan contains 82 charts, stretching from the Straits of Gibraltar to the island of Lampedusa. 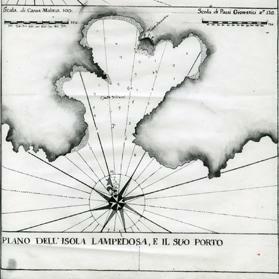 There are two charts of the island on a single folio sheet titled Piano dell’isola Lampedosa (sic), e il suo porto, marked number ‘80’ in ink by Borg, and number ‘82’ in pencil by a later hand. A map of the whole island is shown in the upper part of the sheet, with a plan of the harbour in the lower part. In the same volume there are five charts of Malta which I described in detail in my article on Borg in the said newsletter, and whom I named as the leading Maltese cartographer. 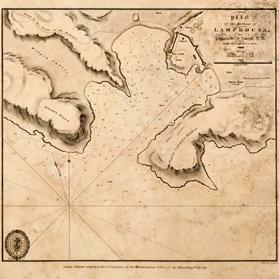 Manuscript map of Lampedusa (above) and of the island’s harbour (below) produced in the last quarter of the 18th century by Antonio Borg. During the reign of De Rohan, the Order of St John, whose galleys often cruised around Lampedusa, kept a small establishment on that island consisting of a priest and six Maltese men. They were well treated by the pirates who traded with them and even provided the priest with oil for lighting the lamp that burned in the little chapel dedicated to the Blessed Virgin Mary. The chapel is depicted on Borg’s chart and captioned N:S:V: Maria. To the right of the chapel there is a structure with a crescent named marabuto, which could have been a mausoleum erected on the death of a member of the African sect known as Marabuti, visited by a large number of devotees, and covered with vows and offerings. Indeed, the famous cosmographer Vincenzo Coronelli related that the Turks were governed by a ridiculous superstition, namely, that no one would be able to leave the island unless he left something there. In 1823, the renowned Captain William Henry Smyth published The hydrography of Sicily, Malta, and the adjacent islands; surveyed in 1814, 1815, and 1816. 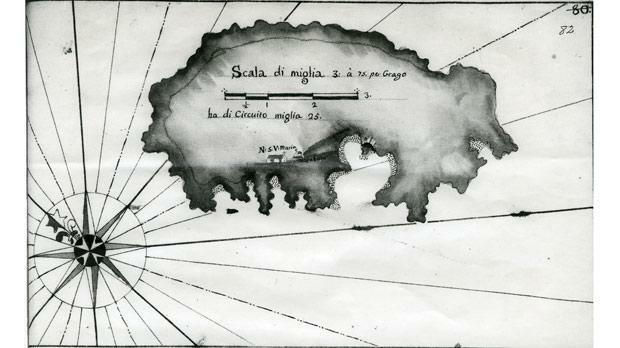 At the bottom of plate 26, he produced a chart of the harbour of Lampedusa showing, among other features, the castle and the chapel, while in the lower half of plate 27, he printed a map of the same island indicating a ‘mosque’ to the right of the chapel, on the road to the castle. In his book on Sicily and its islands (1824) Smyth explained that at a little distance from Cala Croce, up a ravine, there was a grotto, the residence of a celebrated hermit, divided partly into a Catholic chapel and partly into a ‘Mahometan’ mosque. By 1823, Lampedusa had gone through various vicissitudes, part of its interesting modern history. The island was a dependency of Sicily, and for long periods it was never inhabited on account, it was said, of the horrible spectres that haunted it. In 1667, it was acquired under feudal tenure with the title of prince by the learned Ferdinand Tomasi of Palermo, a grandee of Spain, in whose family it remained for more than a century. On June 25, 1800, his descendant Prince Giulio Maria Tomasi, Duke of Palma, granted Lampedusa in perpetual emphyteusis to the Maltese merchant Salvatore Gatt in the records of Notary S. Scibona of Palermo. The perpetual lease was subject to the condition that Gatt had to build at his expense two coastal towers, one at the Cala della Galere, the other at Cala della Madonna, both facing south. Immediately he took possession, Gatt took over Maltese workers to inhabit the deserted island; he imported livestock of all kinds, constructed a windmill, and started cultivating the land. He reconstructed the old castle (sited in the main harbour between Wilga Point and Punta Cavallo Bianco), furnished it with all that was necessary to render it operational, including guns, and hoisted the British flag for protection. Strangely, on June 27, 1804, the prince made another concession to the Maltese Giuseppe Bugeja. At this period, relations between Britain and Naples were at their best, and interest in acquiring Lampedusa for Britain was not lacking. On October 11, 1800, William Eton, who aspired to become the head of the quarantine establishment at Malta, informed the Secretary of State that he could procure the cession of the island from the Court of Naples, stating that Empress Catherine of Russia was keen to take it over. 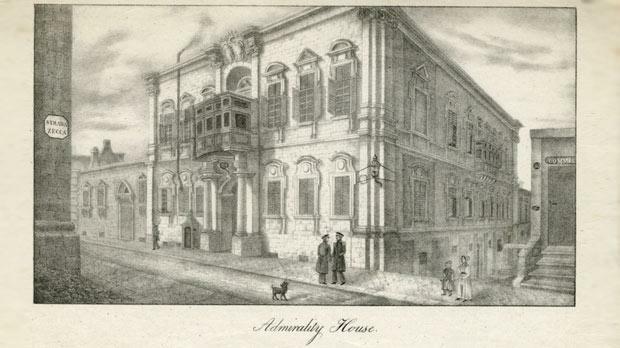 Lithographed side view of the Army Commissariat in Strada Mezzodi, Valletta, corner with Strada Zecca, the office of Lt Alexander Fernandez. Malta’s Civil Commissioner, Sir Alexander Ball (1802-1809), supported the proposal to acquire Lampedusa in his correspondence with London, either for Britain or for himself. But the most active lobbyist was Alexander Fernandez of the Army Commissariat in the Mediterranean, stationed in Malta. Even before the French surrender, instigated apparently by Ball, he expressed the view to use the island as a sort of depot for bullocks and sheep extracted from different parts of Barbary. In May 1803, the British Navy affirmed that the small port of Lampedusa was in no way comparable to the secure harbour facilities that Malta had to offer. The report by Captain Durban, however, mooted the view that Lampedusa could prove a useful adjunct to Malta’s limited agricultural capacity. This notwithstanding, Ball returned to the charge in 1804 and again in 1806, mentioning the fishing banks all round that island among other reasons, including the possibility that Sicily might fall into French hands, causing Malta to lose its main source of essential foodstuffs. But no positive action from the British government was forthcoming. On January 1, 1810, just over two months after Ball’s demise, Fernandez entered into a deed of sub-emphyteusis with Gatt, binding himself to pay a ground rent of 3,000 scudi per annum. He sought to develop Lampedusa as a personal venture with a large farm for the breeding and fattening of bulls and sheep. In a short while, he was handling 50 head of horned cattle and 1,600 sheep, and employing 28 workers, principally to prepare the surface of the island for pasturage on a larger scale. By the end of May 1810, a survey of the island had been completed, together with a map, a plan of the harbour and drawings of the ancient castle. Smyth’s island map of 1823 shows the ‘Farm of Fernandez, Well, Cornfields and Cultivated Valley, to the north-east of the harbour’. In a dispute on the extent of the land leased to him, Fernandez sent from Malta architect Salvatore Cachia to take the necessary measurements. In 1811, Fernandez obtained some military support by way of a small detachment of 26 men under a Lieutenant of the 14th Regiment. Meanwhile, as a result of the vibrant Maltese petitions of 1810 and 1811 for the grant of a free press and political rights, a Royal Commission was appointed to enquire upon the affairs of Malta. In its report of October 16, 1812, it examined the very considerable difficulties that would attend the execution of the project for converting the islands of Pantelleria, Lampedusa and Linosa into farms for the supply of Malta with a view to render it independent of the neighbouring countries, Sicily in particular. At the time, Lampedusa had no population beyond the 30 or 40 people sent there by Fernandez. The commission found the project to be open to various objections and it could not venture to recommend it. The same objections applied to Linosa, which was a mere appendage to Lampedusa. However, as late as April 1813, the Civil Commissioner Lt Gen. Hildebrand Oakes (1810-1813) was still asking the British Navy to keep an eye on Lampedusa. Fernandez was planning to build a fort on the island to be occupied by a detachment of British troops. The Treasury found the whole situation concerning Fernandez very strange, ‘an officer in HM’s leave’ to be the sole proprietor of Lampedusa. He was called upon to give an explanation of his conduct, and his pay was in the meantime suspended. Besides, Lt Gen. Sir Thomas Maitland (1813-1824) was instructed to call for an explanation and to take all appropriate measures. Maitland instantly visited Lampedusa and reported that the whole business from first to last was ‘an idle and foolish speculation’. He was authorised to drop Lampedusa completely and he announced ‘the final withdrawal of the troops and stores then there’ by a Government Notice of September 15, 1814. But disaster had overtaken the island almost a year before. In November 1813, HM’s ship Partridge arrived at Malta infected with Yellow Fever and was ordered to repair to Lampedusa and remain there till convalescent. Panic struck the worker inhabitants who were close to 200, and with the exception of 50 or 60 people, they all fled back to Malta in two small vessels, never to return. Among the Maltese workers on the island were names like Vella, Cassar, Debono, Fenech, Theuma, Zammit and Mallia. It has been recorded that in 1813, Fernandez escaped to Gibraltar. This might have happened while the plague was raging in Malta or because of the Yellow Fever. But he kept hanging on to his title in spite of all adversities. On March 1, 1818, he petitioned the British Government for compensation in respect of losses he had incurred through official encouragement, official let-downs, and sheer bad luck. His claim amounted to £44,000, which was turned down. Soon after, he was deprived of his title to Lampedusa by a judgment of the Sicilian courts at the instance of Gatt as he had defaulted to pay the ground rent of 3,000 scudi due to Gatt. One of the misfortunes be­falling Lampedusa was brought about by Greek privateers who were raiding the African coast, carrying off provisions from Tunis and depositing them on that island. Their ships also took refuge in Lampedusa harbour when they were pursued by the vessels of the Bey of Tunis. In the same year that Fernandez left the island for Gibraltar, Gatt took refuge in Mehedia (or Mahdia) on the eastern coast of Tunisia, perhaps for the same reasons. With the departure of Fernandez, the Gatt family retook complete possession of Lampedusa, but what happened in the next few years is shrouded in mystery. From various sources, the Gatt family can be pieced together. Salvatore Gatt was the son of Giuseppe and Gerolama, but his date of birth is unknown; his marriage, however, is recorded in the archive of St Paul’s collegiate church in Valletta. On October 17, 1786, he married Giacoma Leone, who bore various children, including Antonio Epifanio, the eldest, Giuseppe, married to Barbara Frendo, Maria, who married Ignazio Molinos (a notary) on October 17, 1809, and Pietro Paolo, who married Michela Caruana on July 10, 1826. Girolama married Fortunato Frendo and they had three children, Carmelo, Luigi and Maria Elisabetta. It appears that Salvatore died some time between 1813 and 1821, or he simply disappeared. In 1821, a lawsuit in Sicily was instituted by his children and their spouses as heirs of Gatt. But when, where, and how he died, has yet to be revealed. On March 20, 1824, the Maltese government informed London that he was residing on Lampedusa with his family, but this is highly unlikely. Indeed, Fortunato Frendo had made himself lord of the island and Maria Molinos affirmed in a petition to the Neapolitan government that in April 1822 her mother Giacoma had been brutally murdered by Frendo, who was still free to enjoy her property without prosecution. She also stated that when she left the island to live in Malta, the Gatt family had misappropriated her share and, when she sent Giovanni Azzopardi to take charge of her property, he was killed and buried on the island. Besides, the Catholic priests were banned and their church was plundered. A sad story indeed. An official expedition from Naples led by Lt Salvatore Colucci in 1828 found that Lampedusa was then inhabited by these people: Fortunato and Giuseppe Frendo, Antonino, Giuseppe and Pietro Gatt, Barbara and Girolama Gatt née Frendo, Michelina, Fortunata and Antonina Gatt, as well as children of Fortunato and Girolama Frendo, Giuseppe and Barbara Gatt, Pietro and Michelina Gatt, and Fortunata Gatt, together with nine workers. These details were given by Giovanni Fragapane in his book on Lampedusa (Palermo, 1993), kindly lent to the author by Michael Galea. In all, the Gatt family cultivated Lampedusa as their colony for over 40 years. In 1816, Naples and Sicily were merged into the Kingdom of the Two Sicilies, but for over two decades the central government of the new realm did not exercise any effective control on the island. In 1841 there was for the first time a show of force when a warship was sent to the island, but without any follow-up. It was only on September 11, 1843, that decisive action was taken. Two Neapolitan warships arrived at midday and an­nounced their presence by the firing of a gun. The commander of the expedition landed and sought out the Gatt and Molinos families as title holders. Girolama Gatt and her husband Fortunato Frendo, together with their labourers, were told by the officer that the Neapolitan government in­tended to station a number of troops on the island. Four hundred soldiers went ashore, the British flag flying over the Gatt residence was lowered and substituted by the flag of Naples. This was also raised over the fort. A decree of the King of Two Sicilies was read out, proclaiming the occupation of the island, without prejudice however to the rights of the Gatts and the Molinos. The Gatts were offered a free passage to Palermo, but Mrs Frendo preferred to come back to Malta with the Maltese settlers. Meanwhile, some members of the Gatt family had gone to Sfax in Tunisia. A continental newspaper had announced on August 10 that the expedition was going to take place because the Gatts had refused to recognise the sovereignty of the kingdom. It was reported on October 16 that Girolama née Gatt had returned to Malta with the discharged workers, while her husband remained on the island with a few Maltese. She might have come aboard the Maltese speronara Giojosa on October 10, 1843 sailing from Mahdia and Lampedusa, but this has to be ascertained. The fate of Fortunato Frendo remains in obscurity. A minor incident involving Malta and Lampedusa came about in 1844, but it impinged on the title of the Maltese colonisers. On January 15, 1844, the Maltese schooner Attivo, captained by Pietro Paolo Musù, left Malta for Tunis. The vessel suffered damage in a heavy storm and it had to seek shelter in Lampedusa. As water had started to creep in, the cargo had to be discharged for the necessary repairs to be effected. When the ship was ready to leave, the port authorities informed the captain that departure had to be authorised from Palermo and that, in any case, part of the cargo by law now belonged to the crown. The problem of the crown’s sovereignty came into the picture, with correspondence between the Vice-Admiral of H.M. Queen and the Governor of Malta. Besides, on January 7, 1844, Thomas Gallwey, the British Consul in Naples, wrote to the Commander-in-Chief of the Mediterranean Fleet that, although the island owed its allegiance to the Crown of the Two Sicilies, it was the property of a Sicilian noble, as the crown had not yet completed the contemplated purchase. Meanwhile, Naples had formed a penal settlement on the island. It would be interesting to know how and when the island passed from the Prince of Lampedusa to the King of Naples and what was paid to the Gatt family for the rescission of the deed of perpetual emphyteusis contracted on June 25, 1800. Only some months ago, the Rabbit Beach of Lampedusa was crowned the number one beach in the world by Trip Advisor reviewers. The Prime Minister of Italy affirmed that it deserved the Nobel Prize for its humanitarian services. Yet, much like Malta, Italy is vainly crying for the help and support of the big and powerful associates in the same consortium.